Toronto really does have something for everyone, something that makes it a particularly enticing travel destination. Whether you’re coming here as a couple or with kids in tow, you’re a foodie or a beer lover, you’re on the hunt to see some eye-catching art, or you love being active – there’s something in Toronto to suit your needs and interest level. With that in mind, here’s a slice of Toronto for every type of traveler. There’s a thriving culinary scene in Toronto, so anyone who enjoys traveling for the food will be right at home here. The city’s multicultural population means that you can any type of cuisine here, from Greek and Italian to Ethiopian, Indian, Vietnamese, Mexican and almost everything in between. Start your food-focused tour through Toronto at sprawling St. Lawrence Market, voted number one food market in the world by National Geographic. Here you’ll find over 120 specialty food vendors, from cheese and meats, to baked goods, prepared goods and produce. Next up, find some time to eat your way through some of Toronto’s tastiest neighborhoods, including Greektown, Gerrard India Bazaar, Little Tibet, Chinatown, Koreatown and Little Portugal. Great food can also be found in Kensington Market in the form of small, ethnic eateries serving up everything from tacos to empanadas. Whether it’s world-class museums you’re after or smaller independent galleries, Toronto is filled with opportunities to get your arts and culture fix. Start with the big guns: Art Gallery of Ontario (AGO) and Royal Ontario Museum (ROM). You can spend hours in each and still not cover all the ground there is to cover. Other good options include the Bata Shoe Museum for anyone interested in the history of footwear, Aga Khan Museum and the ​Gardiner Museum, which showcases ceramics. Smaller galleries to add to your itinerary include Clint Roenisch, Cooper Cole, Angell Gallery, Stephen Bulger Gallery and Power Plant Contemporary Art Gallery. Families traveling to Toronto will have no problem finding things to do that the whole family will love. Kid-friendly attractions abound providing fun for a wide variety of ages and interest levels. Kids of all ages will love Ripley’s Aquarium of Canada, which is home to 16,000 aquatic animals including sharks, rays, and many other underwater creatures. Curious kids will also love the Ontario Science Centre, which has hands-on educational exhibition areas geared towards all ages, from the very young, up to teens. Another family-friendly attraction well worth checking out is the CN Tower, which includes a glass floor with views 324 meters (1122 feet) straight down. Toronto has been experiencing a bit of a craft beer boom as of late so any beer lovers coming to Toronto will have their pick of places to get a pint and have the opportunity to visit one of the many breweries in the city, for a tour or just to try some of the more interesting beers being brewed in Toronto. Steam Whistle Brewing, Amsterdam and Mill Street are three of the most well-known breweries in the city where you can take a tour that includes samples. If you’d rather check out some of the smaller breweries there are many options. Some of the best include Blood Brothers Brewing, Halo Brewery, Rainhard, Henderson Brewing Co., Bandit Brewery and Bellwoods Brewery. 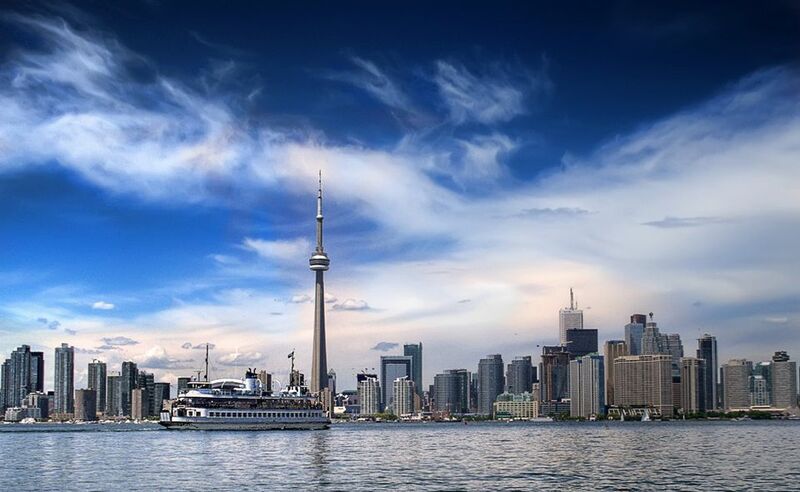 No matter what you’re looking to spend your money on, be it clothing, music, art, accessories or something to spruce up your home, you’ll likely find what you’re looking for in Toronto. There are numerous shopping opportunities here, from malls to markets to shopping streets. In terms of malls, the Toronto CF Eaton Centre and Yorkdale Mall are two of the best malls in the city. Areas conducive to shopping abound, including Bloor-Yorkville for high-end stores and designer brands, West Queen West and Ossington Avenue for unique fashion finds, Kensington Market for quirky and vintage goods, Leslieville in the city’s east end for unique fashion and accessories and Roncesvalles for cute gift ideas and artisanal foods. Depending on when you’re visiting, there are a variety of sports teams you can cheer on in Toronto. We’ve got the Blue Jays if baseball is your sport of choice, the Raptors for basketball fans, Argonauts for anyone looking for football, Toronto FC for soccer fans, Toronto Maple Leafs (NHL) and Toronto Marlies (AHL) for hockey, and even Toronto Rock for anyone looking to catch a professional lacrosse game. In addition, Toronto is also home to the Hockey Hall of Fame, which has the largest collection of hockey memorabilia in the world and where you can get up close and personal with the Stanley Cup. Toronto is a great destination for couples looking for a romantic city break. The city boasts numerous spas, making it easy to book a couples’ massage if some pampering is on the agenda. Elmwood Spa has several packages geared towards couples, as do Spa My Blend by Clarins in The Ritz-Carlton and Novo Spa in Yorkville. One of the most romantic neighborhoods in the city has to be the Distillery District, with its Victorian-era architecture and cobblestone streets. It’s easy to spend half a day here, strolling among the many shops, galleries, cafes, and restaurants. If you feel like getting moving during a visit to Toronto you have lots of options. In the summer (or if you’re OK with bundling up), the city is home to a plethora of parks to hike in and explore. Some of the best include Rouge Park, High Park, and Tommy Thompson Park. If you’re more of a swimmer, Toronto boasts 61 indoor and 57 outdoor public pools to dive into. Wintertime means the chance to skate on one of the city’s many outdoor skating rinks, including Natrel Rink on Toronto’s waterfront, the rink at Nathan Philips Square and Colonel Sam Smith Skating Trail. Switching seasons again, summer is a great time to canoe, kayak and paddleboard in Toronto so there are lots of options no matter when you choose to visit. Craving some live music? Toronto is a haven for music fans thanks to numerous live music venues in all shapes and sizes all over the city. One of the best small music venues in the city is the Horseshoe Tavern, a bar and music venue since 1947 where the likes of the Rolling Stones, Tragically Hip, Joel Plaskett, Matt Mays, Kathleen Edwards and The Strokes have graced the stage. Other good places to check out include the Dakota Tavern, Lees Palace, and the Danforth Music Hall. If you’re a record collector, you’re in luck – there are several spots to shop for vinyl in the city including Rotate This, Sonic Boom, Dead Dog Records, Soundscapes, Kops Records, Pandemonium and She Said Boom. Love to read? You’re in luck since Toronto is home to ​a good selection of bookstores where you can browse and buy anything from bestsellers to quirky vintage and antique tomes. If its one-of-a-kinds and quirky you’re after you’ll want to make a stop at Monkey’s Paw, which stocks obscure and uncommon titles you’re not likely to find anywhere else. This shop is also home to the Bibliomat, a coin-operated vending machine that dispenses old books (it’s a random selection so your book will be a surprise). TYPE Books is a good spot for more independent finds as well as a good selection of cookbooks, and other worthwhile stops include Book City (several locations) and BMV. Bibliophiles may also want to check out Toronto’s literary-themed bar, Famous Last Words, where the drinks are all named after books and shelves lined with reading material.